1993 Mumbai blasts convict Yakub Memon is set to be hanged after his final petition was rejected by the Supreme Court on Tuesday. Back in 2007, Rediff.com's Sheela Bhatt had profiled Yakub after he was sentenced to death by the Terrorist and Disruptive Actives (Prevention) Act court for criminal conspiracy and financing air tickets to send co-conspirators for arms and RDX training to Pakistan. The honourable Terrorist and Disruptive Actives (Prevention) Act court's 12th death sentence in the 1993 Mumbai blasts case has surprised legal eagles who are aware of the details of the case. Nitin Pradhan, Majid Memon and Subhash Kanse, senior Bombay high court lawyers who were once associated with the case for the accused, told rediff.com they were surprised by the death sentence to Yakub Memon, one of the main accused and brother of key accused Tiger Memon who is absconding; they were expecting a life sentence for him. No knowledgeable person -- among the police, lawyers, witnesses or the media -- who has been regularly associated with the case has any doubt that Tiger Memon and some family members were behind the horrifying terrorist act of March 12, 1993, the serial blasts which tore Mumbai apart on that black Friday, leaving 257 people dead and over 700 others injured. In the public mind, it remains an unpardonable act of terror also because after the December 1992-January 1993 communal riots and the 1993 serial blasts, Mumbai's society has never recovered fully. The wounds inflicted during those painful times on the city's psyche have proved deeper than expected. Indians, particularly Mumbaikars, do feel a sense of justice restored, albeit painfully late, by the respected TADA court's judgments. Still, Yakub Memon is another story. "The honourable judge has taken an unexpected view," said a senior lawyer who represented the blasts accused but withdrew from the case. "We will have to read the full text of the judgment," he continued, "but what I haven't understood is how can he (the judge) punish Yakub under the Indian Penal Code? TADA doesn't allow death sentence for conspirators. Yakub is clearly termed by the respected judge as a conspirator in the case. My understanding is that in his case a question could be asked if his is 'the rarest of the rare' case justifying a death sentence." Yakub Memon, a chartered accountant by profession, is the younger brother of Tiger Memon, and the most educated member of the family. The Memons fled India on March 10, 1993, two days before the Mumbai blasts. The case was brilliantly detected by the Mumbai police, led by Rakesh Maria, now the city's joint commissioner of police (crime), after an unattended Maruti 800 car was found in Worli in southcentral Mumbai by the police on the local beat. The car registration papers were in Rubina Memon's name. That led the police to the Memon brothers' flats in the Al-Hussaini building in Mahim, central Mumbai. When the police were searching one of the flats, Maria found keys to a two-wheeler on top of the refrigerator. They were soon found to be of an explosives-laden vehicle parked in Katha Bazar, south Mumbai. Initially, the case had more than 190 accused. That was curtailed after some years, the list eventually pruned to 123 accused; out of them, 100 have been convicted. The Central Bureau of Investigation pruned the number of witnesses from 3,000 to just 684, and the trials were held in Mumbai on a daily basis. Despite a giant operation for the investigation -- the likes of which had never been taken up before -- the Mumbai police failed to catch the prime accused: Dawood Ibrahim, Tiger Memon and others; they had escaped to Pakistan and gone underground. In the initial years, they were kept under house arrest in Karachi. It was a diplomatic embarrassment and uncomforting fact for the investigators -- that they were not able to book the Indian culprits because they were hiding in an 'enemy' country. India-Pakistan relations were at their nadir at that time. Pakistan's role in giving Dawood Ibrahim and the Memons shelter has been proved beyond doubt; but till today India's nuclear neighbour remains unaffected -- diplomatically or otherwise -- for harbouring the most wanted terrorists. 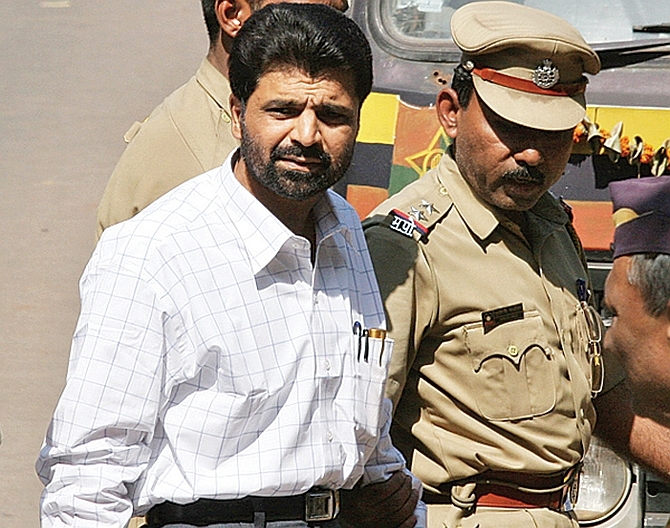 Yakub Memon was the first accused in the 1993 blasts case to call Pakistan's bluff. He dared to escape house arrest in Karachi. Rahin claims their daughter's impending birth hastened their decision to return to India. The CBI says he was arrested in New Delhi on August 5, 1994. One is not aware of the entire 'deal' between Yakub Menon and the intelligence agencies but in 1994, the media knew that under a 'very special arrangement' Yakub and some of his family members were brought back from Pakistan via Dubai. Yakub came via Nepal. He claimed in court that he was arrested in Nepal. Probably, under the 'deal' he struck with CBI, he took a decision to not reveal some data, thinking that if he cooperated with the investigating agencies throughout the trial he would be dealt with compassionately. It seems Yakub stood by his promise. "Majid Menon, with whom I practice, was his (Yakub's) lawyer, later Harshad Ponda came for the final arguments," says Yakub's lawyer Satish Kanse. "Somehow, the Memons are keeping silent, and the 'deal' part never came on record. That is the difficulty." A former special director of the Intelligence Bureau told rediff.com: "The deal that Yakub stuck with the CBI seems to have gone sour." Yakub, 45, who has already spent 13 years in Indian jails, has been given the death penalty under the IPC, and not under TADA. He could not have been prepared for the way the torturously long saga of the 1993 bomb blasts trial has ended for him. His stand had been consistent -- that he is innocent. He strongly believed he would not be given the death penalty. In an emotional appeal, Yakub said he surrendered to the authorities on July 28, 1994, and was followed by his family. He said he had cooperated with the CBI in its investigation and regretted that he was being framed for conspiracy. He had followed the trial in minute detail and was always prepared to help the defence lawyer and even the court. Although the TADA court has delivered its judgment on the historical case, it is difficult to put a full stop to Yakub Memon's tragic story. It is surprising that neither the defendant nor the prosecution brought to the notice of the court certain mitigating circumstances relating to Yakub Memon and eight of his family members. Many legal experts had believed that in view of certain mitigating circumstances the prosecution would not demand the death penalty for Yakub and his relatives. It is believed that by July 1994, some 16 months after the blasts, Yakub and other members of Tiger Memon's extended family felt uncomfortable living in Pakistan under the Inter Service Intelligence agency's protection. There is no evidence available this side of the border supporting this story, but the fact that eight members of prime accused Tiger Memon's family -- Tiger's father the late Abdul Razak Memon, mother Haneef, brother Suleman and his wife Rubina, Yakub and his wife Rahin, and younger Memons Isha and Yusuf -- came back from Pakistan is itself evidence that they had regrets and they wanted to subject themselves to Indian laws. The prosecution had once alleged that the Memons came back to handle their properties but that cannot be the only reason because most of their properties have been sealed by the government since 1993. The jewellery left behind in their garage by the family before fleeing India -- including diamonds and gold items worth around Rs 10 million -- has been in the TADA court's possession since 1993. It is alleged that Yakub's reasoning was that only Tiger was involved in the blasts and terrorist activities and since he (Yakub) and other family members were 'innocent,' they should make themselves available for questioning to the Mumbai police. Yakub's version, which does not corroborate with the CBI's version in the courtroom, was that since his 'conscience' was clear, nothing would happen to him. Yakub wanted to consult his Mumbai-based lawyer cousin about the advisability of surrendering to the Indian authorities. In 1994, Yakub flew to Kathmandu by a Pakistan International Airlines flight. His relative and the young family lawyer met him there. When rediff.com contacted the lawyer in Mumbai, he denied any such meeting, refused to talk, and disconnected the line. It is alleged that as a lawyer he strongly advised Yakub against surrender. The Memon family, Dawood Ibrahim and his associates feared being killed in a police encounter. They feared the Indian security agencies would have them killed and show them as killed in an encounter. In Nepal, Yakub developed cold feet and decided to fly back to Karcahi. It is believed that as he was boarding the PIA bus to reach the aircraft, his shoulder bag fell and out tumbled six Indian passports. A Nepalese policeman noticed this and immediately detained him. Yakub had the Indian passports of all the members of the family, except Tiger Memon. The Nepalese -- who have good working relations with the Indian police and the Indian Army -- immediately alerted the Research and Analysis Wing, which requested the CBI to depute an officer to Kathmandu to identify the person detained. Even after the Indians established that the detained person was Yakub Memon, the Nepalese authorities did not want to formally arrest him. This happens sometimes in vulnerable or political cases. The Nepalese were worried that if they formally arrested Yakub, they would have to produce him before their court and Dawood Ibrahim's lawyers would see to it that he would not be handed over to India. Dawood's notorious network in Nepal then was well-known. If Dawood swung into action, it would become a big legal battle. It was therefore decided that they would bring Yakub in a car from Kathmandu to Bihar and informally hand him over to the Indian police without any record about the handover. The story has not been officially admitted, ever. But the media noted in August 1994 the inexplicable circumstances around Yakub's arrival and the arrest in the bylanes of New Delhi. The intelligence agency's aircraft was sent to a town near the Bihar-Nepal border to take possession of Yakub. The moment the Nepalese police reached the town and handed him over, he was flown to Delhi and handed over to the Intelligence Bureau. Then prime minister P V Narasimha Rao was informed. Then, the big intelligence operation was planned and launched. Yakub cooperated with the CBI in persuading some other members of his family to go to Dubai from Karachi and surrender to the Indian authorities. The Indian officers agreed to such an operation because it was in the national interest. It had been frustrating for the Indian authorities to watch meekly the absconders of the terror case hiding in a neighbouring country. A senior IB officer, who was later implicated in an embarrassing spy case, was sent to Dubai to make diplomatic arrangements for receiving the Memons and sending them to India.